1920 pixels on the long side and 300 ppi (pixels per inch). File size between 1MB to 2MB (megabytes) File names should include photographer's first and last name and theme. While there's no right or wrong in photography, when reviewing your own photographs for submission, good judgment and common sense go a long way and should be used at all times. your own and those of others. March guest presenter, artist and photographer Maggy Walton, talked about "The Intersection of Art and Tech" during her presentation, describing how she takes her own photography "one step further" as illustrative digital photography -- capturing a moment in time from nature and architecture using an iPhone camera and graphics software to create her images. ​and http://www.shopvida.com/collections/maggy-walton or stop in at Art Gallery Napa Valley, 1307 First St. Guest presenter John Ehrenfeld, right, and NVPS member Brian Kearney set up for the February presentation. Nature and wildlife photographer John Ehrenfeld was a television commercial producer, with his own company until his love and affection for nature and wildlife shaped the path he has taken since. Now a Napa County resident, he is dedicated to his art, traveling far and wide to photograph the wildlife that intrigues and delights him -- always concentrating on his local area which he loves, from the Pacific to the Sierras, from the San Joaquin Valley to the Oregon border. Brian Kearney, left, and guest presenter Todd Pickering, right, set up for the January NVPS meeting held at the American Legion Hall. During the January meeting, popular guest presenter, professional photographer Todd Pickering, discussed some of the photographic "challenges and solutions" he considers when planning his own photography projects -- whether it's a pair of Spotted owls near his Marin County home, a wrecked fishing boat off the coast of Sitka, Alaska, or an imaginative way of photographing wine labels for a client. His interests are far reaching, from animals and landscapes, to vineyards, portraits, waterways, architecture and more -- in black and white and color. Although his travels have taken him from above the Arctic Circle in Norway to the rainforests in Hawaii and the jungles of Sri Lanka, most days you can find him walking the Point Reyes region which he has been photographing for 30 years. In place of a December meeting and critique, the traditional annual NVPS holiday potluck dinner was held in early December at the Jessel Gallery, 1019 Atlas Peak Rd. The club took in $965 from the club's first holiday party silent auction and raffle, NVPS president Gary Sampson noted, and thanked both donors and participants for making the raffle and evening a success. "One thing we should remind people is that because of this extra income we can hold membership dues steady to help fund our budget needs and add extras like NVPS sponsored workshops," he said. 1. A cooking lesson with a professional chef, followed by dinner for two with Marissa and Lorenzo at Napa members only Kitchen Collective with choice of menu (meat, fish, or veggie). Donated by Marissa Carlisle and Lorenzo Mills. 2. A Magna Chrome offer of $75 towards the printing of a metal print. 3. A collection of spices donated by Angie Johnson. 4. Two quilted wall hangings donated by quilter/photographer Ann Seronello. 5. Two $50 Bay Photo gift certificates donated by new members Bill and Lorraine Wright. 6. Two $25 gift certificates from Van Winden's Garden Center. November presenter Stuart Schwartz, center, talks with NVPS member Ron Rogers, as Chris Sauer, foreground left, and Elizabeth Bush wait their turn. Stuart Schwartz, the November guest presenter, shared his passion for photographing people and discussed The Image Flow, a photography resource center and gallery which he opened in 2008. The personal work of the Art Center College of Design graduate, who founded and operated a studio in Switzerland for 15 years before returning to the U.S. to work for ad agencies and design firms, varies from street photography to abstract photography and mixed media. During his presentation Schwartz reintroduced NVPS members to the works of iconic photographers Richard Avedon, Irving Penn and Robert Frank, as well as showed examples of his own "street" images, offering insights and tips. Below are examples of images by NVPS members, taken outside their own comfort zones. In lieu of the usual monthly critique, September's guests, Susan and Neil Silverman, served as jurors, selecting images for inclusion in the October NVPS exhibit at the CIA at Copia. Twenty-seven pieces were selected and once the final images were chosen, the Silvermans discussed the reasoning behind their selections. Susan Silverman and NVPS members during a lighthearted moment at the Sept. 24 meeting. The Silvermans compliment participants on the quality of their work and are thanked by the membership in return. Participants should drop off their selected images at the CIA at Copia Monday, Oct. 1, or Tuesday, Oct. 2 between 11 a.m. and 4 p.m. in the gift shop. Be sure the photographs or metal prints are securely wrapped and marked with the photographer's name. Each selected image must include the original identifying tag. ​The opening reception is Friday, Oct. 5, from 5:30 to 8:30 p.m.
Pickup at CIA at Copia at show's end, Wednesday, Oct. 31, 11 a.m. to 4 p.m.
Baum believes that although it takes just a split second to make a photograph, the journey to that shutter click, that visual insight, is many years in the making. Among his suggestions during the critique: Get comfortable using a tripod, compose from the outside edges in. Guest photographer Lowell Downey, left, and NVPS member Brian Kearney review technical aspects of image projection during the presentation. Lowell Downey, co-owner of Napa-based Art & Clarity with Janna Waldinger, was the guest presenter at the July 23 meeting, discussing the photographer's use of light -- as well as other factors used to accentuate the light: background, depth of field, tension and emotion, and what the photographer is trying to impart. New NVPS officers and board members include, front row kneeling, Gary Sampson, president; second row from left, George Bartolome, secretary; Natalie Syverson, immediate past president; Karen Noyes, hospitality coordinator; Angie Johnson, member at large, Geoff Hansen, interim treasurer; third row from left, Wayne Lipps, field trips coordinator; Brian Kearney, digital projectionist; Lanny Johnson, membership and Master Communicator; Rick De Bernardi, vice president, and Elizabeth Bush, program chair. Not shown, Carolyn Younger, website manager. 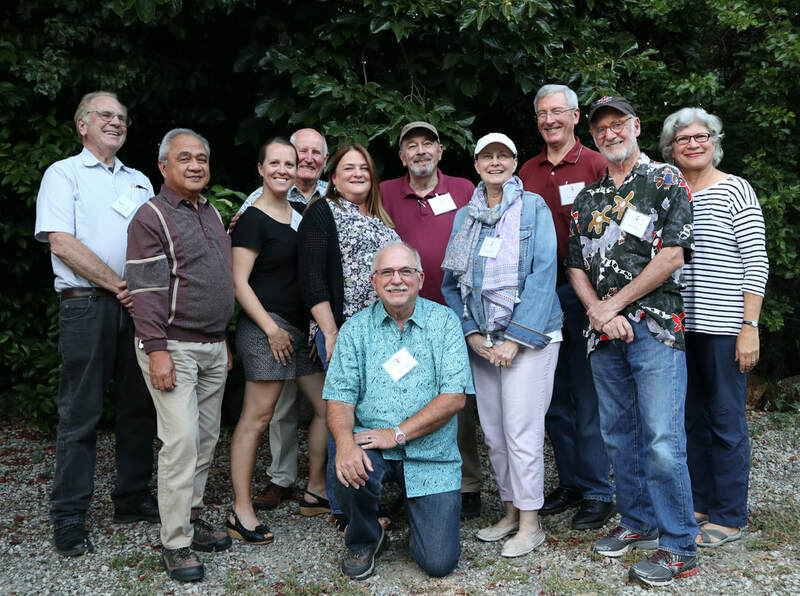 The June general meeting began with a business meeting that included a discussion and approval of the coming year's budget, guest speakers through November, the club's annual show -- this year at the CIA at Copia in October -- and the election of officers. The members' Minute-to-Spin-It slideshow of favorite new images was preceded by a club social. Phil Venable, center, researches the answer to a question at a recent meeting. With him, from left, are Brian Kearney, Christa Meyer and George Bartolome. In back, Geoff Hansen. 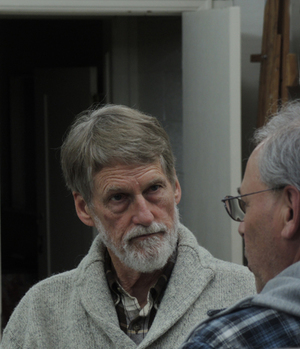 NVPS member Phil Venable, a seasoned art show entrant and award winner, shared his insights at the April meeting on how contest entries are critiqued and judged. 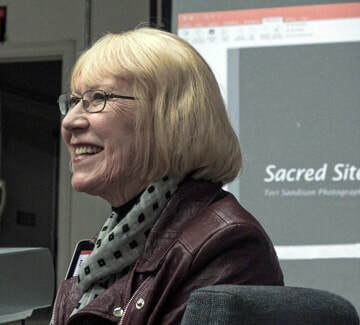 Teri Sandison returned to speak to NVPS members March 26 and present her recent “Sacred Sites and Ancient Wisdom” images from many countries and traditions, and talk about her participation in an early March 'Bridges-not Walls' exhibit in Mexico. "All successful photographs arise from the passion of the photographer," Sandison believes, and urged photographers to analyse their images -- Is an emotion/passion successfully conveyed to the viewer? Especially using ‘point of view,' composition, color, and lighting? On Feb. 26, photographer and Pulitzer Prize finalist Frederic Larson dropped by to discuss his more than 30 years as a photojournalist -- years during which a police scanner was part of his photographic gear. In those days he developed film in gas-station bathrooms, walked the streets of the Tenderloin with the "boombox" camera he created, wielded the first digital camera at a Superbowl and managed to continue making a living even in today's world of selfie sticks and iPhones. Twice named California Photographer of the Year, Larson's interests and images are wide-ranging, varied and adventurous. In addition his Friends of Photography meetups (whose stated goal is to help everyone take better pictures, become a better photographer -- and have fun) he leads workshops in San Francisco and Hawaii. He has received numerous awards for his work, "But," he writes on his website, "the most satisfying photography for me is my documentary work ... stories I have developed on my own ... I have met people who have inspired me and given my work a new passion, people of unwavering spirit who survive despite horrible situations." Josh Lutz president of Magna Chrome, a Concord-based company that prints photographic images on metal, gave a lively presentation at the NVPS Jan. 22 meeting explaining his company's history, the process and what sets it apart from traditional printing methods. Printing on metal was developed by the company nearly a decade ago. Magna Chrome has also supplied the technology and designed and built the heat presses for AdoramaPix and Bay Photo, as well as other printing firms. Those interested in having their images printed on metal sent in two images to learn if they'd be good candidates for this style of printing. And a number of members who have used the process brought examples of their work to the meeting. Other examples can be seen at the Magna Chrome website, http://magnachrome.com/ or by stopping by the Napa Senior Center gallery on Jefferson through the end of January to see additional images on metal by NVPS members. NVPS member Joe Sinclair, who toured the premises a while back, wrote an article noting that, in addition to being beautiful, the prints have an archival life of more than 100 years years so long as they are kept out of direct sunlight. (Joe managed to surprise Josh when his two images taken during his tour turned up in the critique.) To read more about the process, see Joe's write-up on the Tech Tips page. NVPS member and past member of the board, Karen Noyes, is a talented underwater photographer who has traveled to the world's more remote oceans and seas to photograph their often elusive marine residents. She discussed her most recent travels, showed her camera and the waterproof housing she uses on her underwater adventures and shared images of some of the exotic and colorful creatures she has captured photographically. During a break in the November meeting Joseph Sinclair and Karen Noyes discuss the underwater camera equipment used on her dive expeditions. Jan Lightfoot answers a question during a break in the October program. The October guest speaker Jan Lightfoot﻿'s love of photography became an enduring passion from the time she was in the fourth grade. Photography continues to fascinate her and it is what drives her to seek adventures close to home and in the far reaches of the world, most recently South Africa and Namibia. Her presentation included an array of impressive images, among them the animals of Namibia's Etosha National Park, the red dunes of Sossusvlei in the Namib Desert and the sand-swept buildings of the abandoned diamond mine, Kolmanskop. Her images zero in on often overlooked or under appreciated details. The evening's images included photos of discoveries made during road trips -- Elizabeth Bush in Utah; George Bartolome, Nancy Hernandez and Ann Seronello on a visit to Sturgeon'e Mill in Sebastopol, and Gary Sampson during an early September visit to the National Heirloom Exposition in Santa Rosa. Roger Hagan shared images taken with a cherished film camera during a European adventure on the heels of World War II. MJ Shaer used selective color in the glimpses he provided of a lake retreat in the Sierra Nevada range and Carolyn Younger revealed a fishing drama on the Napa River in the heart of downtown. Wayne Lipps shared some favorite photos of youngsters and animals (including an intense Smokey the Cat). Marissa Carlisle unveiled recent experiments in portrait photography, while Lanny Johnson proved that even a trip to the car wash can be a worthy photo opportunity. Joe Sinclair's photos reflected the width and breadth of his interests, and Chris Sauer's took viewers from Guatemala to Portugal and the streets of San Francisco. ​Finally, in the best tradition of grandparenting, Brian Kearney shared an impressive array of action shots taken during his grandson's weekend rugby matches. They are all here in the slideshow below for you to enjoy. Davis-based photographer Andrea Stone (silhouetted against the screen) describes one of the images comprising her City Reflections project, 'Reverie #2, Portland, Oregon,' during a slideshow presentation at the August NVPS meeting. Andrea Stone -- half the creative force behind Stone Photography Studio, founded with her husband, Rob, in downtown Davis -- was the guest presenter at the August NVPS meeting. Stone explained that a lifelong interest in color, form and design led to exploring photography more than two decades ago, then went on to narrate a slideshow of stunning images from her award-winning 'City Reflections Project,' which got its start during the couple's visit to Portland in 2011. A high-rise of windows reflecting neighboring buildings caught her eye. That particular photograph led to years of travel ​in search of other reflective wonders, as well as nearby structures from which to photograph them. This project segued into her "Elements" series, and more recently, Stone revealed, she is embarking on a new project, one in which a smart phone camera plays a major role. In a time when everyone seems to have a camera and doesn't hesitate to use it, Stone encouraged club members to shoot what captures their interest but to consider ways to put their own individual stamp on what they photograph. 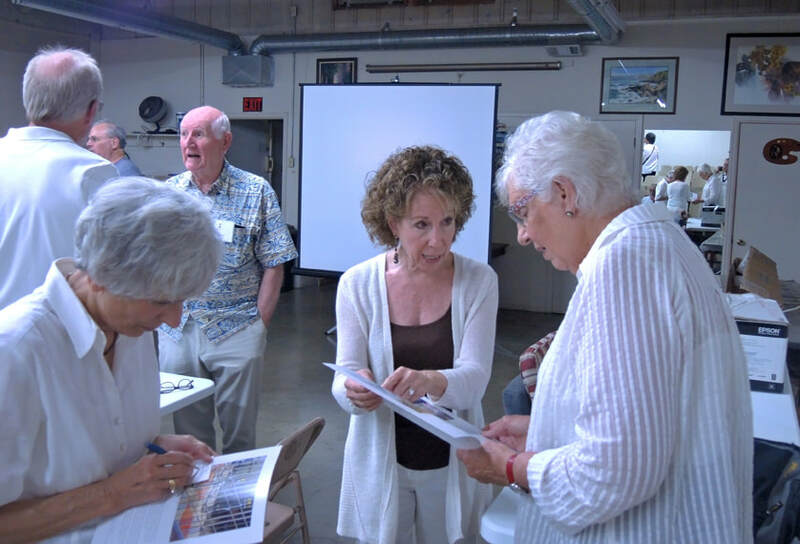 The regular July 24 meeting with guest presenter Mitchell Glotzer included the annual business meeting followed by a members' Minute-to-Spin-It slideshow of new images which was held over from the June meeting. During the business meeting, Geoff Hansen was approved as NVPS treasurer, replacing Karen Noyes who will be working with Natalie Syverson as hospitality chair. Glotzer, a Napa Valley resident, began photographing the renovation of downtown Napa's historic Uptown Theatre in 2008. The Uptown originally opened in August, 1937, and the restored art deco building now showcases popular musical acts and comedians. Glotzer has been the theater's house photographer since it reopened in May, 2010. It's great gig, he notes. He is also the house photographer for BottleRock, the Blue Note in the restored Napa Opera House, and the Mondavi Winery summer music festival. This year he will again be photographing Napa's Porch Fest. ​During the July meeting he provided a number of insights into photographing in low light situations as well as how to capture the fast-paced, music scene (use aperture priority, be considerate, wear ear plugs) and recounted special moments that stood out in his seven years of capturing the antics of nationally known musicians. When he has time, he also turns his eye and camera lens on the Napa Valley landscape. Night photography is another interest. For the want of a key the June meeting was cancelled and the planned business meeting and members' Minute -To-Spin-It presentations was held in July instead. Now a retired documentary filmmaker and publications editor living in the Napa Valley, Roger Hagan was 19 years old when he and a friend set off to explore Mexico in the early 1950s. The resulting negatives were then boxed and set aside for decades while Hagen explored other avenues. Among his documentary films are "Stations," "Downtowns For People," "About Us: The Deep South Portrait," and a film for the Ford Foundation about Seattle's 30-year voluntary school desegregation program. In the intervening years he has also published compilations of his photographs in book form, including "Cold Stone," "Personal Best," "In My Dream" and more recently, "Mexico 1953" and "Mexico '53: The Road Trip." Hagan's evocative images shot in Mexico with a used Rolleiflex more than half a century ago had NVPS members enthralled. The slideshow, accompanied by a haunting musical score, as well as Hagan's narration, provided a glimpse of a time long past, of a people both generous, accommodating and full of hope for better times ahead. At the March meeting, long-time Napa Valley Register photo editor, J.L Sousa, who has photographed just about every subject from politicians to puddles, barbeques to bud break in his 30-year career, presented images he shot using either a digital camera or a smart phone. He then commented on the images presented by NVPS who submitted their own favorite photos for this month's critique. When it comes to photography, February's guest, Dona Kopol Bonick, can be called a "generalist," as comfortable shooting weddings and portraits, as she is taking on fine art projects as well as those featuring agriculture, food, wineries and corporate events. Her knowledge, energy, enthusiasm and intellectual curiosity made for a lively and inspiring NVPS meeting whose theme was portraiture. Dona has been photographing the people, places and wines of the Napa Valley for more than 20 years. A recent exhibit at Robert Mondavi Winery was a family endeavor that featured the art of her husband and sons in addition to her own fine art images influenced by her fondness for the 1940s and film noir. Other fine art images are in the di Rosa art museum collection and private collections worldwide. She has been commissioned to create portraits of Robert and Margrit Mondavi, Francis Ford Coppola as well as 40 vintners for the Auction Napa Valley catalog. Using humor and images of a world frequently invisible to the naked eye, Bob Westfall treated NVPS members to remarkable portraits of critters pursuing busy lives in our homes and gardens. Bob discussed the techniques, skills and gear he uses to photograph macro subjects such as insects, as well as answered questions on the “how and where” of close up photography. He has been pursuing this type of photography for years, and has produced insect photographs for U.C Davis instructors. Secrets of infrared photography and tips for shooting successful black and white digital images were revealed by guest speaker, Bill Helsel, at the November NVPS members meeting. The fine art, architectural, and stock photographer who also teaches and leads photography workshops, had a number of ideas about what he wanted to be when he was growing up in Washington, D.C.
'Gradually my interests shifted toward photography and city planning,' he writes on his website. 'In 1969 I went to London for a two-year post-grad program in planning, but soon found myself spending as little time as possible studying planning and as much as possible on learning and practicing photography. One thing led to another, and by the time I returned to the U.S. in 1971 I had a credible portfolio of architectural photography and had shot small jobs for several clients, including two architectural firms and a major German magazine. It had taken a while, but I finally understood that it was possible to make a living as a full-time photographer, and that I had to give it a try. Todd Pickering, a popular NVPS guest speaker, met with the photographic society on Monday, Oct. 24. The theme, 'Triptych,' caused some confusion but Pickering's humor and thoughtful observations ruled the evening. ​The photographer's travels have taken him from above the Arctic Circle in Norway to the rain forests in Hawaii and the jungles of Sri Lanka. Nowadays you can find him walking the Point Reyes region on the Marin County coast where he currently leads workshops. He has been photographing in and around Point Reyes for the past 30 years and says his love for the region gets down to the nuances of the land: the blackberry, the creek, the redwood, the light , the smells. One of Pickering's projects is the Point Reyes Center for Photography which he started as a gathering place for people who share the same love of photography and the land. The center is an evolving experiment, he says, and one he envisions taking many forms -- from education, to photography shows, to sales. His plan is to bring photographic educators from outside the area to help infuse new ideas and techniques. 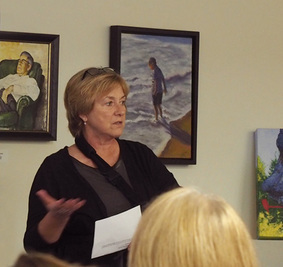 There was no guest speaker at the Monday, Sept. 26 general meeting. Instead, NVPS members interested in twilight photography met at the corner of Fifth and Main streets across from the Riverfront Inn and historic Napa Mill and then was free to go where they wanted to shoot. August presenter Michael Gan, left, answers a question posed by NVPS member Wayne Lipps. The Nocturnes annual Alumni Night is scheduled for Saturday, Nov. 19. Once the business part of the June meeting was completed (Natalie Syverson was voted in as NVPS president, Michael Gan is the new Vice President, George Bartolome remains as Secretary and Karen Noyes is joining the board as Treasurer. Elizabeth Bush continues as Immediate Past President) the meeting's Minute-To-Spin-It presentation got underway, offering a variety of members' photographic experiences, at home, across the U.S. and abroad. Gee Gee Williams and Wayne Lipps discuss the appetizer options at the May meeting. In May NVPS members were encouraged to get out and explore the areas of the Valley that might not catch the eye of the casual observer. Hiking trails, local parks, creeks, the Napa River, remote farms, marshes ... there was no end of photo possibilities 'off the beaten path.' ​In addition to a discussion of the upcoming club election, there was a social hour with after-dinner treats. Members submitted examples of recent work , challenging images based on travels, experiments, etc. with a brief explanation. ​NVPS member and presenter Phil Venable offered tips on workflow, file naming and photo back-up solutions. Phil was a youngster armed with a Kodak Brownie when he first started taking photographs. He went on to study photography in college with an eye toward going into photojournalism. Instead he became a police officer and it wasn't until nearly a decade ago that he started photographing in earnest. Landscapes, vintage vehicles, even plumbing get the Venable treatment -- becoming striking digitally enhanced photographic images, many of them prize winners. He also has exhibited a local galleries and wineries. The March 28 guest presenters, Susan and Neil Silverman, are Santa Rosa-based professional photographers whose imagination and insight suited them for this month's theme, Imaginarium. It was a no-holds-barred opportunity for NVPS members to explore photo styles and software manipulation and even break a few traditional photography 'rules' to create unique images. The Silvermans turn their own camera lenses on a variety of subject matter -- people, nature, landscape, weddings, special events, travel, commercial and industrial sites -- presenting them in often unexpected ways. Their work is represented by national and international stock agencies and has appeared in a variety of publications including the cover of Outdoor Photography, Elle Magazine, Sierra Club, Microsoft, Pacific Rim Magazine, Cure Magazine, der Spiegel, Tamrac International Catalogue Cover, Nikon World, The Wooden boat, Nikon International Catalogue, and Proceedings among many others. Wildlife photographer Dan Suzio wowed NVPS members at the February meeting with a selection of his vibrant photos of birds, both exotic and familiar. During the course of the evening he also suggested strategies he finds useful on his photo expeditions. 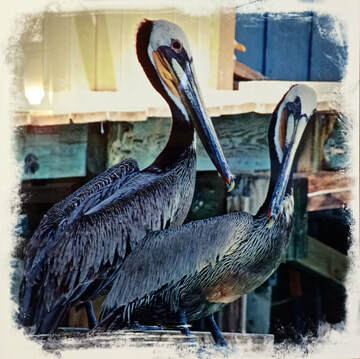 ​Suzio, who became fascinated with nature and wildlife photography in 1978, has been providing nature and wildlife photography for books, magazines, calendars, brochures, museum exhibits, advertising, and a variety of other uses ever since. He hasn't limited his interest to birds, however. He has also trained his camera on frogs and toads, snakes and lizards, mammals, native plants and numerous locations in Death Valley and other U.S. deserts. The author of 'The Photographer's Guide to Death Valley' has also photographed in Costa Rica and Ecuador as well as National Parks throughout the western U.S., and conducted scientific research and studied wildlife and local culture in the Southeast Asia country of East Timor. Every photo is captioned and keyworded with common and Latin names, location, behavior, Federal and State endangered status, and other relevant information. At the end of his initial presentation it was Suzio's turn to be wowed by the images submitted by NVPS members. Award -winning fine art photographer Harvey Abernathy's love of the outdoors as well as night photography was influenced by his early years growing up on North Dakota's Great Plains with its 180-degree view of from horizon to horizon. "We had abundant opportunities for observation of the stars, planets, Milky Way, and Northern Lights…"
Although best known for his landscape and nature images for both daylight and nighttime photography, his current night portfolio integrates a selection of imagery that inspired a body of work called “Serenata Nocturna.” He strives to create works that capture and preserve the beauty in nature and the magic of the night - images that will interest the viewer and convey a sense of excitement about the places, color, and tone in the images. "I especially enjoy capturing the 'Magic of the Night,' exploring the subtleties of light by taking long exposures … creating images beyond the visual perception of the eye." Abernathy was generous with his knowledge and tips for shooting in limited light . He also stressed the importance of planning ahead. His numerous images, including those of the Milky Way at Drake's Bay and the moon decending on a Golden Gate Bridge tower, underscored his advice. With a nod to the start of a busy holiday season, there was no guest speaker in November. Instead NVPS members brought appetizers to the meeting and gave an informal presentation of up to 10 images each. They had several minutes to describe, explain or discuss their submitted images. The result was a visually varied and intriguing evening peppered with banter and compliments from the audience. The scheduled guest speaker for October, Todd Pickering, was unable to join us. Instead Ann Seronello described her five-day stay at a photography workshop on Madeline Island at the Madeline Island School of the Arts on the Minnesota side of Lake Superior. Part of the adventure, she said, in addition to waking at 5 a.m., was touring and photographing the island's inlets and lagoons. An NVPS stipend helped defray the cost of the workshop and if Ann's glorious waterscapes are any indication, it was money well spent. 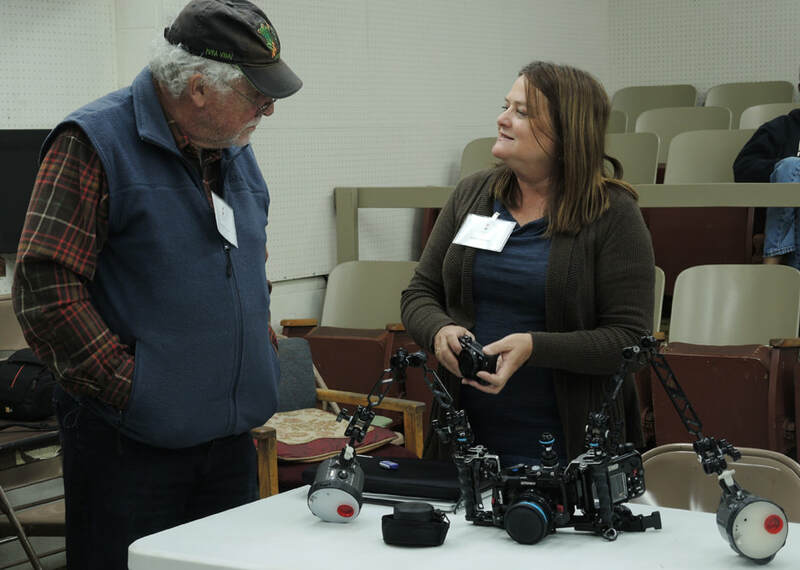 During the meeting, NVPS program chair Phil Venable stepped in with a collection of various intriguing film cameras as well as digital and film photographs, and presented his rationale for continuing to use film in this age of digital imagery. In his case, he said, shooting with film keeps him in touch with the subject and forces him to take his time with composition, lighting and focus. Following his presentation, members participating in the "Out of the Shadows" critique, had a chance to offer insight into the why and where of their photos. All in all it was a fascinating evening that generated lively discussion. ​Guest speaker Jan Lightfoot﻿'s love of photography became an enduring passion from the time she was in the fourth grade and took her Brownie camera with her on a field trip to a California mission. "Capturing those pictures on film, taking it to the drugstore and two weeks later, picking up 12 blurry black and white photos with ragged edges was thrilling," she recalled, adding that photography continues to fascinate her and it is what drives her to seek adventures close to home and in the far reaches of the world. She shared valuable insights during the September meeting and suggested new paths of thought. 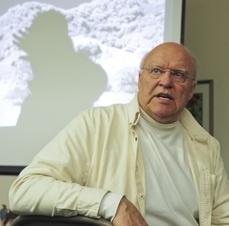 The August guest speaker was award-winning Santa Rosa photographer Chuck Honek, whose array of personal images reflect the broad spectrum of his interests -- ancient structures in North Africa, dramatic landscapes in the United States, people and animals. Chuck has led photo tours to many parts of the world. He stressed the importance of the Rule of Thirds in composing images, and understanding how the eye and camera differ in what they "see." His skills as a judge have been called on numerous times, including for the Marin County Fair and the Napa Town and Country Fair." Professional photographer Teri Sandison, who considers light one of the most valuable of a photographer's tools, presented a thoughtful discussion on the value of light and its place in her commercial as well as fine art photography. Critique theme: Using Light: natural or artificial. ﻿April's members meeting theme was a "Minute-To-Spin-It" in combination with a potluck of snacks and drinks. No guest speaker attended this meeting. Natalie Syverson gave a stipend presentation about her trip to St. Louis. View the video she created. Rich Turner, the March 26 guest speaker, is an established aerial, fine art and commercial photographer based in Stockton, California since 1974. Prior to opening his own studio in 1990 he was the Director of Photography at the Stockton Record newspaper for 16 years earning numerous awards for news, sports and feature photography. All photos published on this website are copyright protected and cannot be used without authorization of the photographer. If you wish to use or purchase a specific image, contact the Website Manager, who will provide the photographer with your contact information. NVPS members who does not wish to have their images displayed on this website, please contact the Website Manager who can remove the image or images.